LATAM Airlines Group, Latin America’s leading airline group, took delivery of its first A320neo – showcasing its white, indigo and coral livery and powered by Pratt & Whitney Pure Power PW1100-JM engines – on Monday, August 29, at Airbus headquarters in Toulouse. 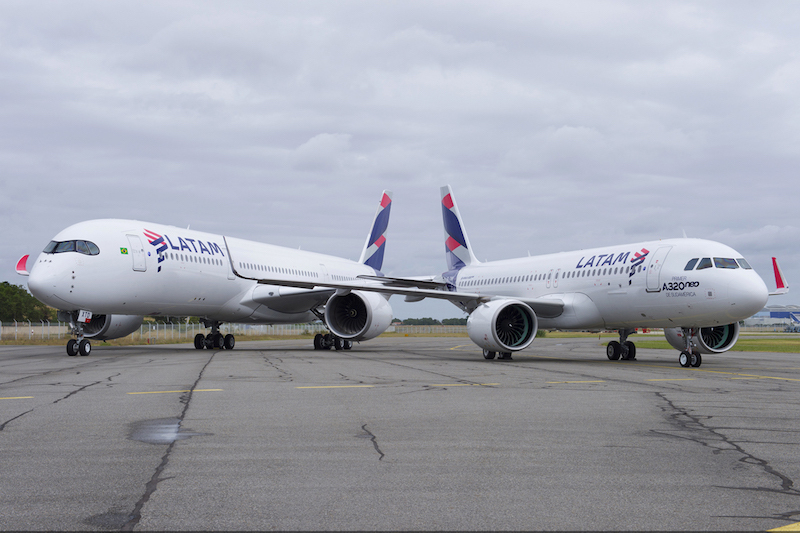 LATAM Airlines Brasil will become the first airline in North and South America, and the fifth operator in the world, to operate the ultra-fuel efficient aircraft type. Executives from LATAM and Airbus attended a delivery ceremony, which also marked the delivery of LATAM’s fourth A350 XWB — the first with the airline group’s new brand livery. LATAM was also the Americas’ first A350 XWB operator. The aircraft is configured in a 174-seat layout with 18” wide seats and equipped with the innovative Space-Flex cabin configuration. LATAM was the first in Latin America to order the A320neo in 2011, shortly after the program was launched. The airline group has a total of 67 A320neo Family aircraft on order. Initially, LATAM plans to fly its first A320neo on Brazilian domestic routes to Brasília, Belo Horizonte, Campo Grande, Curitiba, Florianópolis, Porto Alegre, Recife, Rio de Janeiro (Galeão) and São Paulo (Guarulhos). In November, LATAM will begin to fly regional routes throughout South America. The second LATAM A320neo, to be delivered later this year, is also expected to operate regional flights. The airline group has more than 250 Airbus aircraft in operation. The A320neo Family is the world’s best-selling single aisle product line with over 4,600 orders from 85 customers since its launch in 2010 capturing almost 60 percent share of the market. Thanks to their widest cabin, all members of the A320neo Family offer unmatched comfort in all classes and Airbus’ 18” wide seats in economy as standard. Including LATAM’s A320neo delivered today, 16 A320neo aircraft have been delivered to five customers.